controls the behaviour if several different beats overlap in time. Without 'Smooth' the result changes apruptly from the value of the one beat to the value of the other, whereas with the 'Smooth' option there is a smooth transition between the different beats. must be linked to the first of the beats which should be combined. allows to modify the amplitude of beat 1 such that the reaction on it gets stronger or weaker. must be linked to the second of the beats which should be combined. allows to modify the amplitude of beat 2 such that the reaction on it gets stronger or weaker. 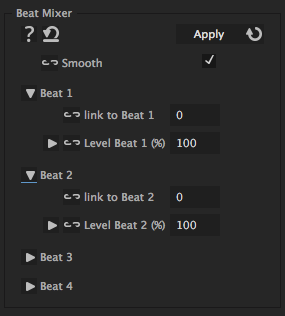 must be linked to the third of the beats which should be combined (or be set to 0 if you only want to combine two beats). allows to modify the amplitude of beat 3 such that the reaction on it gets stronger or weaker. must be linked to the fourth of the beats which should be combined (or be set to 0 if you want to combine less than four beats). allows to modify the amplitude of beat 4 such that the reaction on it gets stronger or weaker.